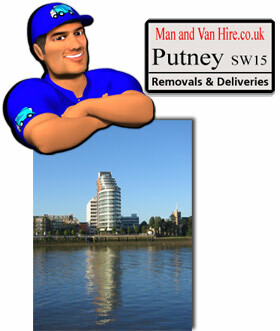 A better man with a clean van available 7 days a week at any time to suit you in Putney, London, SW15. Ours is an ideal local service for any amount in need of shifting. We offer small home or office removals including single item furniture moves within the local vicinity including the Village. We also serve the adjoining districts of Barnes, Castelnau, Fulham and Hammersmith or further afield including the whole of London. We have full local knowledge of SW15 and are very familiar with the approach from Fulham on the the other side of the River Thames. Leave all the heavy work to us - an expert man equipped with a Transit van who can regularly be found driving around your High Street. Get yourself and your possessions safely relocated to were ever you are moving to. Whether moving a single bed or the odd couple bits of furniture to and from home in the heart of Putney or even a full household we can deliver. All areas in the center of town are covered and we are happy to travel any distance out of central London for those longer distance journeys. All of Man and Van Hire's home removal vehicles come equipped with heavy duty removal blankets for protection against scuffs and scratches to furniture while on the move. Other equipment carried on board include a comprehensive tool box which is very handy for dismantling flat pack furniture or disconnecting kitchen appliances. A Man and Van service like ours is perfect for when relocating, why use a large removal company when you only need a light remover? If you have to move a bedsit, flat, house or even a small office including a small business then consider us and save money. All moves are expertly undertaken by professional van men, extra loaders and porters are available on request. Clearing your garage or need to transport items to storage? Then there is a choice of van sizes to accommodate your needs.Give us a call, we will be more than happy to discuss your requirements. The road network and lay out in this neighborhood makes driving around fairly easy if like us you have local sreet knowledge of the area. Although we do use GPS ( Global Positioning Systems ) in all our vans, there are times when these navigational aids can hinder getting about in Putney fast and sending us around the houses instead. We find our way around best when on familiar territory. No amount of technology can replace a professional van man on home ground especially during those busy traffic periods. The River Thames passes through here and once a year the river bank is awash with spectators and fans alike,even the odd white van man such as myself congregate to cheer on the prestigious Oxford and Cambridge University Boat Race, its from here the boat race begins. The starting point at Putney Bridge is marked out on the water by two stake boats and covers just over four miles up stream passing under Hammersmith Bridge to the finish line at Chiswick Bridge. Other vantage points along the course for spectators is Fulham on the North bank and Barnes on the South side then following the race further along through Hammersmith and Mortlake. Oxford and Cambridge crews have been competing against each other in this annual event since the very first race back in 1829. The event by tradition is held on the last Saturday in the month of March. Because of the amount of extra traffic it brings with it to the area it may be advisable to book your man and van in Putney for the morning or later in the day after the race has finished. If you can put off your man and van until the next day then even better and you can enjoy the spectacle, After all Sundays are always the quietest and best day of the week to get around London. If the next day is not an option afforded to you then worry not as we aim to please and and will do our utmost to get you from A to B with the minimum off fuss.